Hello Crafty Friends – Annie here with a quick card. 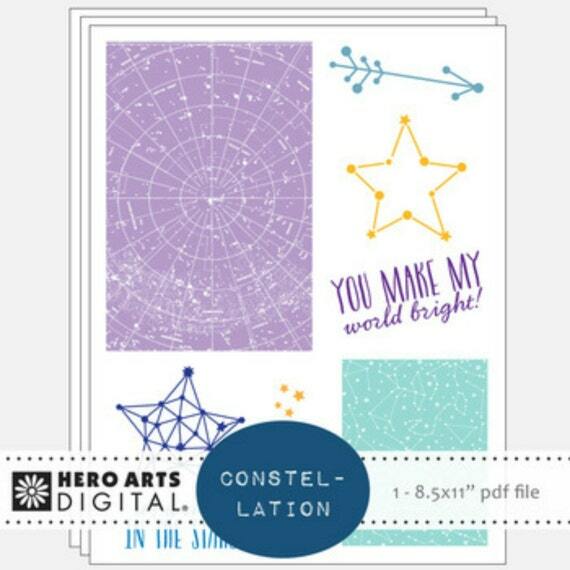 Today, I am using Hero Arts Constellation Printable PT101 Digital these printables are perfect for quick and easy cards. I like to have them on hand – printed and cut. I used the aqua colored constellation, the multi-linked star, and the sentiment. I cut off a point from the star to create a constellation shape heart. I used dark blue cardstock for my card front, layering white cardstock an1/8″ smaller. Then, matted the aqua colored star print onto dark blue shimmer cardstock. I did the same for the sentiment. The sentiment you & me is from Hero Arts DC175 Love Stamp & Cut Set. For finishing touches, I added some tiny stars and heart sequins. Hero Arts DC175 Love Stamp & Cut Set. Categories: Handmade Cards | Tags: Annie Collins, constellations, Hero Arts Constellation Printable, Hero Arts Love Stamp and Cut, Love | Permalink. I love the colors and design. Beautiful card.